The food bank is an initiative of Communicare Trust and this is the 5th year spreading happiness into the lives of less privileged children. 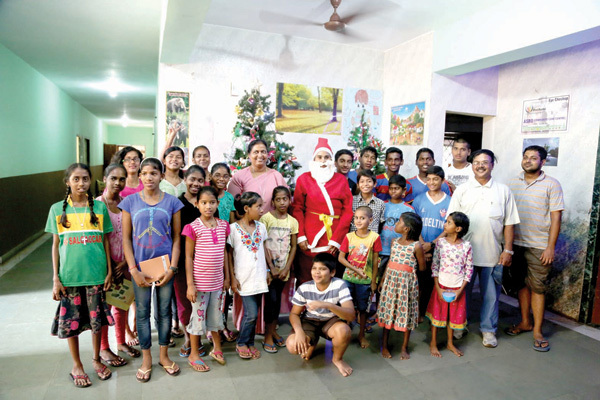 Their bi-annual event, Food Bank, that was recently held saw volunteers at Magsons-Miramar, Caculo Mall, Fatorda, Ponda and Delfinos-Porvorim. All the non perishable food donated by the public was collected and then donated to eight different orphanages. “Let’s not forget the less privileged in our celebrations! Come, donate and make a difference,” said Namitha Nair, project manager. The concept is simple: A shopping list is given by the volunteers to the customers who come to the supermarket to do their regular shopping. This shopping list includes items that the orphanages require like rice, wheat flour, pulses, etc. “There are customers who can give as much as a biscuit packet and others who give a cart full of goodies. Nevertheless every donation counts,” said Nalini Elvino De Souza, manager of Communicare Trust. When asked to elaborate on how they focus on what is needed for the shopping list, Nalini said that the list is prepared only after they have a conversation with a representative of each home. “This is to make sure that they always get what is the most required. Once the entire list is received we make a consolidated one keeping their requirements in mind and that is our 'Food Bank' shopping list,” said Nalini. “We give basic food items such as rice, att’tta, sugar, salt and oil. Besides this we also make sure every home gets pulses which is the most important in their diet. Then there are biscuits, milk powder, tea powder, coffee powder, jam and noodles. We also provide them with detergent powders and soaps for washing clothes and utensils. We make sure they change their toothbrushes every 6 months and hence there are toothbrushes and toothpastes. There are also other supplies like sanitary pads, diapers, candles and matchboxes,” added Namitha. The group that has been carrying out this activity twice a year for the last five years, expressed gratitude to all those who have helped make this campaign bigger every year. Magsons has been associated with this initiative since the beginning and this year Delfino’s in Porvorim extended their support as well. The volunteers come from all walks of life. This year the students of Institute of Hotel Management (IHM) Goa guided by their principal Donna de Souza, conducted the food bank at Delfino’s. In Margao, the campaign had the help of the students from Carmel’s college guided by Aldina Gomes. In Magsons-Ponda, Yheula Vaz ,a teacher from the GVM HSSE, was responsible for the success of the campaign in this taluka collecting 211.5 kg of food. Almost one lakh donations were collected from all the 5 collecting points, i.e, Magsons in Caculo Mall, Magsons in Miramar, Magsons in Ponda and Fatorda as well as Delfino’s in Porvorim. “With all these contributions, we have been able to make this giving season the best one ever with 8 tonnes of food in total,” added Nalini. All the items were distributed to orphanages and women centres located in Ponda, Margao, Panjim, Taleigao, Parra, Bastora and Thivim. “This year we were also able to help the Vanarmare tribe residing in Nirankal,” Namitha pointed out. Donald Fernandes who provides food for abandoned people on the streets, helped us out with the transport for the distribution. Communicare Trust was also able to help families affected by HIV with the help of Peter Borges, who distributed the food to them. “In August 2018 we will be back with the food bank and hope that more volunteers can join and help those who need us the most,” said Nalini.